Isla Rasa is very flat and very small, but as many as half a million birds nest on this island at once. Almost all the Heermann's Gulls and Elegant Terns in the world go there to breed  the Heermann's Gulls from as far away as British Columbia and the Elegant Terns from Peru and Chile. It is so small it is difficult to find on a map. It is between Isla Angel de la Guarda and Isla San Lorenzo, west of Isla Tiburon, in the midriff island region of the Gulf of Calfornia (28° 49 ´ N, 112° 59´ W), approximately 60 km (37 miles) southeast from Bahia de los Angeles, Baja California. Isla Rasa is much flatter and lower than nearby islands, with a maximum elevation of just 35 m (115 feet), compared to a mean elevation of about 500 m (1600 feet) on the other islands. It is only about 150 acres in area. It consists mainly of low hills of volcanic rock and large valleys with deep guano deposits. The island shores are rocky with cliffs mainly in the eastern side and large rock boulders in the rest of the periphery. There are three tidal lagoons at the western side, one of them directly connected with the ocean, which empties at low tide and fills up at high tide. 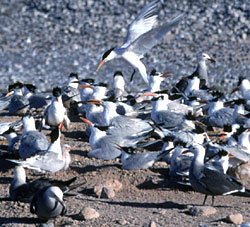 The flat sedimentary valleys of Isla Rasa provide the prime habitat for nesting Heermann's Gulls and Elegant Terns. Studies show that guano from the birds has been accumulating here for centuries, causing changes in the topography. As the area between the hills has filled up with guano, the valleys have enlarged. The climate is very dry, with the scant rain distributed throughout the year, but mainly between August and December. Botanically, the island lies within the Sarcocaulescent Deserts of the Gulf of California (Wiggins 1980). The most abundant plants are two species of cholla (Opuntia cholla and O. bigelovii) which, together with the saltbush (Atriplex barclayana) cover large areas of the island. There are also a few dozen cardons (Pachycereus pringlei), and a few individuals of sour pitahaya (Stenocereus gummosus) and senita (Lophocereus schottii), as well as some shrubs (Lycium brevipes and Cressa truxillensis). This text was adapted with permission from: "The effect of global atmospheric and oceanic anomalies on marine birds: The breeding dynamics of Heermann's Gulls in Isla Rasa"  an article in progress by Enriqueta Velarde and Exequiel Ezcurra.